Today, NASA announced the discovery of the first near-Earth-size planet found in the habitable zone of a star similar to our sun (a G2-type star). Named for the mission which discovered it, Kepler-452b is 60% larger in diameter than the Earth; bigger, but still likely to be a rocky planet. It has a 385-day orbit and is around 6 billion years old. Kepler-452b resides in its host star’s habitable zone, or Goldilock’s Zone. For a G2 Main Sequence star, such as our sun, the habitable zone for an Earth-like planet may be anywhere between .63 and 1.5 AU (Astronomical Units). 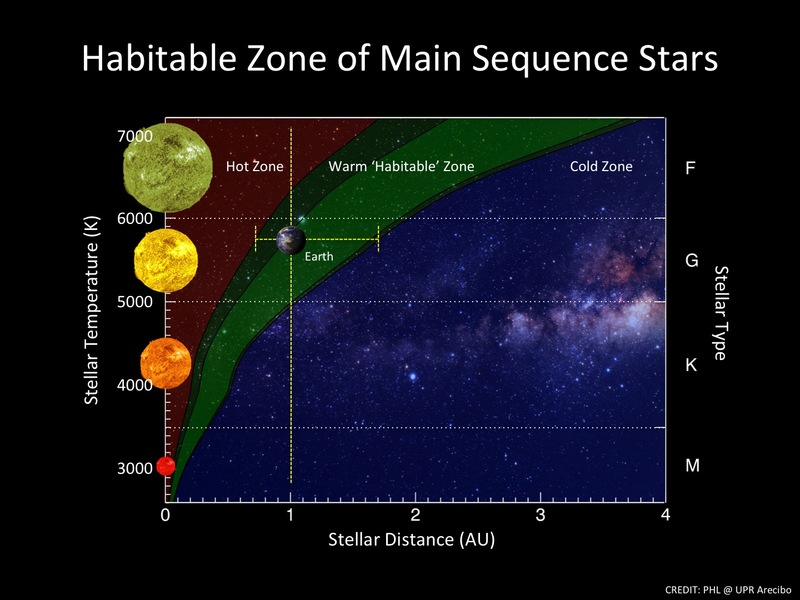 Below is a visual showing the habitable zones for various Main Sequence stars. Assuming Kepler-452b has or has ever had liquid water, its 6 billion years has given it enough time to possibly develop life. While there is much still left to be determined, the possibility of life on other planets is tantalizing and strikes at the essence of space exploration. However, we must remember that with our forays into the cosmos, we have left behind terrible amounts of space junk. Currently, more than 500,000 objects larger than 1 cm and more than 100 million objects smaller than 1 cm may be in orbit around our planet. By the time we are ready to send ourselves into the deepest reaches of the cosmos, our orbit may be too cluttered with junk to guarantee any safe exit from Earth’s gravity. It is imperative that we clean up our region of space, lest we find ourselves caught between a rock and millions of hard places later. Cleaning up our orbits will help ensure the safety of functioning satellites and the International Space Station and will make all future missions, including those into the depths of the cosmos, safer and more practical.